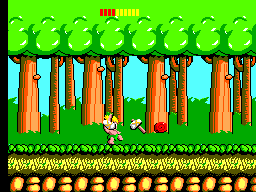 You've probably heard of Wonder Boy. If you haven't, you've heard of it as Adventure Island for the NES. Anyway, you have heard of it somehow. Wonder Boy is, in my opinion, a fun sidescroller with unique gameplay and has lots of challenges. 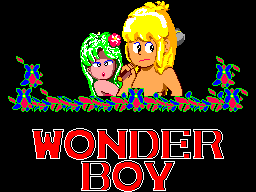 Wonder Boy is about a blonde haired kid who has to get his girlfriend back from evil monsters. This is one flaw of the game: The storyine is unoriginal. Wonder Boy has you running, jumping, and skateboarding your way to the end of the level. It's actually harder than that. Food pops up everywhere, and you will have to collect them before your stamina bar runs out. If you get hit one time and your not riding a skateboard or have a fairy with you, you lose a life. Luckily for you, powerups will help you out. They are hidden in eggs that you have to run over or crack before you can get the powerup inside. Familiar gameplay with a twist. Sounds good to me. The Master System had a thing with graphics. They were probably a little better than the NES. This game is no exception. The backgrounds are the best in my opinion. They look like they're from an era later! The title screen is also good looking. Unfortunately, I was playing this on an emulator and my computer doesn't have a sound chip. So I couldn't hear the sound and music. I need to get the actual system and game or at least on virtual console. The controls are a little wonky here. If you press the A button, he will jump very low. You will have to hold the run/throw button to jump higher. You can also slip and fall into water or bottomless pits. It happened before. Trust me. Wonder Boy has replay value for sure. Something about it makes me want to come back for more and try to beat the level I lost. Maybe it's the graphics, maybe the interesting gameplay. I don't know. But I want to play it right now. 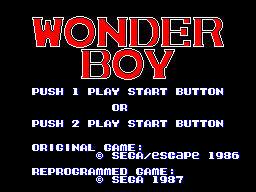 Wonder Boy is a great Master System title. The graphics are awesome, it has lots of replay value, and it's really original. If you see it on eBay, buy it! If you don't have a Master System or don't feel like buying one, download Wonder Boy for the Virtual Console on the Wii, you won't be disappointed.